I have long been a fan of PCG gaming and I really liked what Jerom did with his GB-paletted fantasy tileset. I have been planning on using it in a match-3 mobile game with fantasy elements, but I haven't gotten around to getting very far on it. It's still in the works, but I wanted to make sure I shared what I've added on thus far with everyone. I did some editing and added some additional terrain types, created new enemies, and created a player sprite layering system. 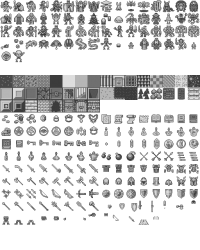 I also created some new item sprites. Everything is, in the vast majority of cases, modifications of Jerom's already created sprites. 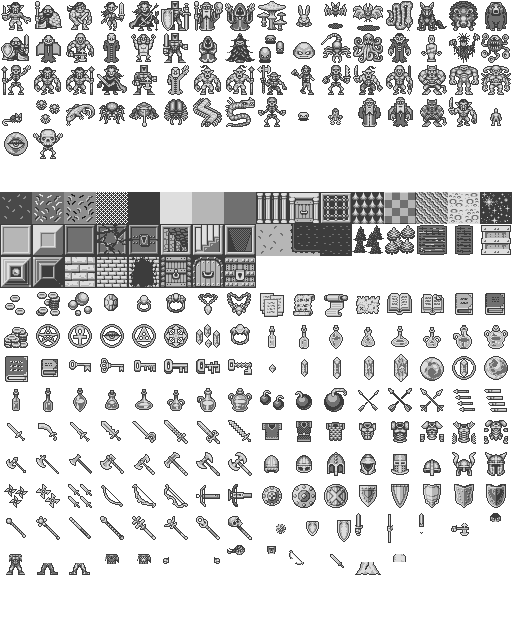 I grayscaled the sprites here just so other folks would have more options as far as a palette is concerned. It would be easy enough to replicate the GB palette again, though. I am uploading the .xcf file for that purpose.